Many people go to Florence for the sites, the museums and the food. 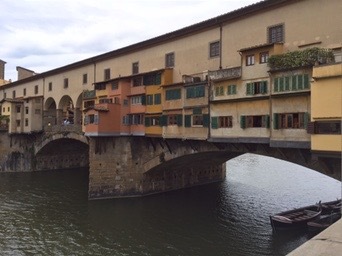 Most tourists end up on Ponte Vecchio (the old bridge). Few realize that there is an ancient passage above the bridge. It is 1 km long going from the Medici offices in the Uffizi Museum to their palace home (Palazzo Pitti) on the other side of the bridge. These were bankers and business men that needed to be able to pass safely from home to their offices and back again. If you look at the Ponte Vecchio on the Uffizi side of the river, you can see a passage go from the museum over the street and then along the river to the bridge. Looking at the top of the bridge you can see the windows of the passage. On the other side of the bridge you can see this ancient passage go inland to the palace. It is still possible to walk it as the Medici once did but you will need a reservation. You have to book it in advance of your trip to Florence. It includes an English-speaking guide and admission to the Uffizi Museum. The price is 89 euros per person. You can book it at this site.